I dreamt of Payne Bros. Ladies Hairdressing Salon, which was on the third floor, last night. Having worked there for about four years, from around 1962 to 1966, I am often haunted by the people I worked with, thinking of them often, as I would dearly love to know what happened to them all. Due to the above, this morning I was Googling Payne Bros., and up came your site, Facts About Durban. Scrolling down the articles I spied a name I have not forgotten. — Rose Enstrom. Could it really be the Enstroms I knew so long ago? — It was and I nearly fell off my chair! I read with a real passion, the story she submitted to you, relating in every way to the contents. I gasped when I saw the first photo with Reg on the left, his wife Flo (both now deceased) who was the oldest sister of five Quirk girls from Woodlands, Durban. My first wife Colleen was the fourth Quirk girl and the Quirk family lived on Norwich Crescent. — Number 27, I think. To the right in the photo, next to Flo, was Aubrey and then his wife Rose. I have not seen or heard of Rose and Aubrey since they left South Africa for Australia, in 1970! I left for Canada in 1977 with my wife and three sons. I was only back once in 1987, with my second wife a Canadian. The four in the photo were neighbours and friends and my family and I often saw the Enstroms when visiting with my in-laws, Reg and Flo Pascoe and their two delightful daughters, Gaylyn and Meryl, who both still live in S.A. The initial purpose of writing to you was to ask if you could send me the E-mail address of the Enstroms and my second is to tell you a little of my story now, so here goes. In the very early 1960s I served my apprenticeship for Ladies Hairdressing at the Payne Bros. Salon on the third floor. It was one of the best periods of my life. — Emblazoned on my memory for eternity! After spending one year at Hilton College, I hated boarding school life, I returned to ‘my old school’ Westville High and did one more year, to end 1960 there. I wanted to become a motor mechanic, as I loved working on motors. My father being a respectable architect in Durban (Payton, Taylor, Willies and Bennett) said, “No son of mine is going to be a grease monkey!” — At that time it was, End of story! I was talked into becoming a Fitter & Turner as the Principal at Natal Tech told me I could, when qualified, get a job on the ships and travel the world. — It had an appealing ring to it. I loved boats and travel, so started an apprenticeship with van Thiel’s Wire Industries on the south coast. It was while living at a Catholic Youth Hostel (McClure House?) on Kenyon Howden Road, Woodlands, that I met Colleen Quirk who would later become my first wife. We used to go to the movie on Saturday night at the M.O.T.H. hall up the road from the hostel. I lived at the hostel as my parents; home was in Westville, on the border with Pinetown, and so too far to travel. There is Willies Road, named after my dad, just off Dawncliffe Road in Westville. It took me about eighteen months before, knowing this was NOT what I wanted to do and, to my parents horror, I quit! It was after some time had elapsed that my mother, who had been a beautician before she was married, suggested that I should try “Hairdressing”. After my mother batted her eye lashes at the Salon Manageress, Miss Nesbit, an interview was arranged for me. I was seventeen, and with hormones raging, I entered this very large Salon where about twenty-five gorgeous girls, that all looked like they’d stepped out of Hollywood, were working. “Sure I’ll give this a try!” I said. I was only the second male Ladies Hairdresser apprentice in the city of Durban. Today after all these years, in my mind’s eye I can still walk through the place, knowing every detail and remembering all ‘The Girls’ but, unfortunately I never knew all the surnames. If any should read this, please e-mail me at tswillies@yahoo.ca. We used to have fabulous Christmas parties at Miss Nesbit’s home, I believe it was. Sandra Sommerville showed me photos of those parties before I left for Canada and I wish I’d made copies then. There is a BBC TV sitcom called, ‘Are You Being Served?’ — It so reminds me of back in the 1960s at Payne Bros. The departments and staff were all so organised and efficient back in those days. A friend Barry Williams, who lived next door to my parents’ house, worked in the Men’s Wear Department. On the weekends we’d all gather in Barry’s attic bedroom to listen to cowboy records and play cards, gambling for matches or pennies if we felt rich enough, till the wee hours of the morning! I remember watching a group of Africans one day who where obviously from the country, very warily checking out the Payne Brothers escalator. They would cautiously get on and then jump off again in a panic! There were three elevators in the lobby. One of them was still operated by a Zulu Lift Operator who would call out all the departments on the floor that we were coming to! I remember one time, I could not find a parking for my Vespa Scooter so I took it up with me in the elevator to the third floor and parked it outside the Salon. — Miss Nesbit nearly had a bird! To me those were wonderful times and I hope this little blurb will trigger memories for someone else. Funnily enough I had my hair done on Friday the 24th June 1966 my wedding day. At that time Payne’s hair salon was the best in Durban. I see you worked at van Thiels. Did you perhaps know Theo Vogels who also lived in Woodlands? He and his wife Dora were my parents best friends. I seem to remember that there were 2 males working at the salon at that time. Hi Jo, Hope you enjoyed my memories and thanks for taking the time to read them. The name Theo Vogels rings a bell with me and if I’m not mistaken he was one of the bosses at van Thiels. I read with interest that you were married in 1966, and I too was married on 26 February, 1966 at the Catholic Church just below the Youth Hostel on Kenyon Howden RD. If you remember the names of the Church and Hostel, please share with me. While I worked at Payne Brothers, there were two males besides me later on; Denis a Greek and Robert a South African and both were qualified stylists. – Ring a bell with you? Regards, Tony. 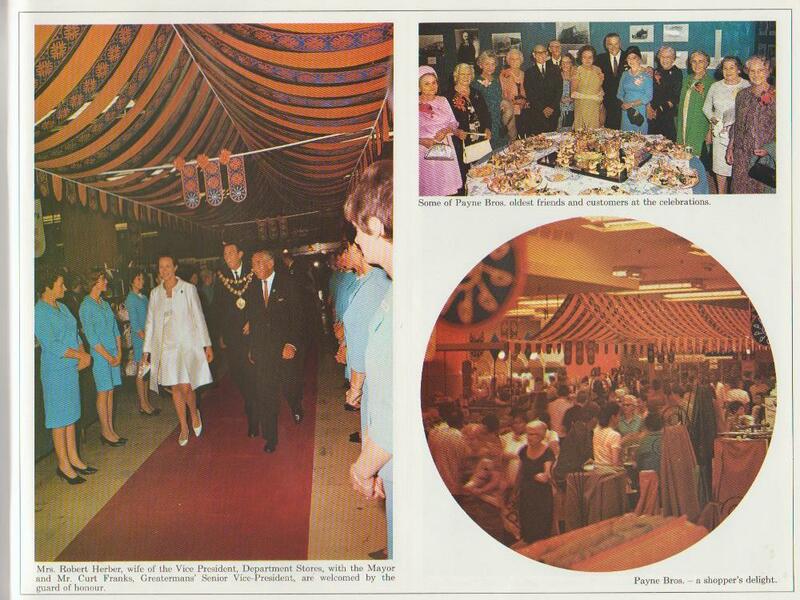 Do you remember the Oriental Exhibition that used to b e held in Payne Bros on the first floor I think. I used to love browsing through it and I remember buying my father a green plastic Chinese back scratcher! (A hand at the end of a short “stick”) I think it was from there that we bought these plastic shells that when placed in water would gradually open to reveal a flower or somesuch. The things we remember! If I recall correctly, the escalator “steps” were actually wood strips with little gaps that proved quite hazardous to ladies who were wearing stilletos! All the department store windows in those days (mid 60’s to early 70’s) had beautiful window displays especially at Christmas time. It was such fun to walk down one side of West Street on a Saturday with lots of other families doing the same thing to look at the window displays, stopping at the Polar Bar on the corner for a twirly cone and then crossing the street to look at the shops down the other side of the street. All perfectly clean and safe in those days. I do remember particularly the windows in Greenacres when they used to display the Bride of the Year photos and also Baby of the Year. Don’t know if it was Greenacres or John Orrs that would have an annual “Plums in May” sale. For some reason that seems to have made an impression on me! We were so lucky to grow up in Durban back then and to have such lovely memories to share. 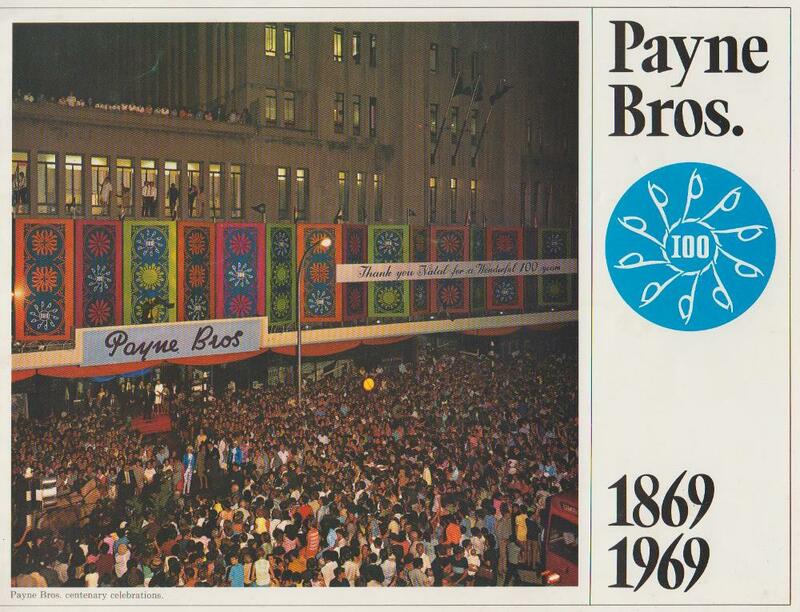 Payne Brothers was one of the icon shops in Durban and celebrated its centenary of existence in Durban in 1969. I have the Centenary Brochure marking the event. I have some sort of link to Paynes through my mother who worked there during the mid 60s. She worked in the Food Section which was situated at the back of the store fronting Pine Street. In those days, the whole back end of the store was floor to ceiling glass panels so the natural light flooded in. The Food Section was on the right looking at Pine Street. Also in Pine Street was Payne’s loading bay where the goods trucks would unload all the new stock. My mother was in charge of the delicatessen and Italian foods counter. Being able to speak Italian and knowing something of Italian foods, my mother enjoyed her “continental” world in the corner of the store. She also used to deal with a lot of Jewish clientele for their special food needs. A certain Mr Buchalter used to call her Mrs Spaghetti! I read in the brochure that Paynes was the first store in Durban to introduce a self service food hall. That was in 1947. The escalator was centrally situated at the front of the store and led up stairs to the ladies department, furniture, the admin offices and also school wear. Quite right the original escalators did have wooden treads and these ran into matching “combs” as they reached the top and turned inward for the return trip to the bottom. They were tricky and I recall in the Johannesburg OK Bazaars a young child getting a toe caught in the tread. Later these were all changed to metal with a finer comb. If I recall OTIS was the only supplier of escalators at the time. Paynes could also be accessed via the lifts which were in the main entrance of the tower building and serviced the upper floors which were let out as offices mainly. I recall in the 60s as well that Tretchikoff had an art exhibition in Paynes and his famous Green Lady was on display. In those days he was still considered a bit of a “freaky, commercial” artist rather than a painter of note that he has become today. Also from the brochure it is noted that the present Paynes Building was completed in 1938 and the escalator was the biggest in the Southern Hemisphere at the time. The store remained with the family until 1953 when it then joined the Greatermans Group. I seem to recall that in the store there were posted signs to the effect that Paynes was the most beautiful store in Africa. I cannot recall when Paynes as such closed but it was sometime in the 1980s/1990s that it did and was converted into a GAME store, which obliterated the memories we have of its one time elegance. Tretchikoff showed his exhibition at Greenacres…. Hi Gerald, Re-reading your very interesting contribution regarding Payne Bros., I have to thank you, although belatedly, for your very descriptive narration, as it brought back memories about the Food section in the rear of the building on the Pine Street side. I tried dusting off my memory cells to remember your mother, “Mrs. Spaghetti” but alas, the memories although tangible, were too vague. It did remind me of another lady that worked in the delicatessen, who had her hair done at the Salon upstairs and you may have been aware of and maybe known her name? In the Ladies Hairdressing Salon on the third floor, where I was an apprentice at the time under the personal supervision of Eloise Sauer an East German girl, I remember one customer of hers from the delicatessen. This customer was a large lady of Jewish/German decent with long hair done up in a ‘Beehive’. For the life of me, I can get a mental picture but not her name! I’m seventy now, so this is about 52 years ago! Hi again Gerald, I’ve just finished lunch and the ‘wheels’ in my brain must have been turning as I believe the ladies name was Mrs. Ogilvie, but I’m not certain? Another name of a customer and worker at Paynes was Mrs. Varner but I can’t remember which department she was working in. — Tony. The only name that I recall of is an Italian lady who also worked in the Food Section and that was a Mrs Tonetti. Another snippet I recall was that you entered the Food Section with your trolley via one of those one way boom turnstiles. Then you paid at an exit where there was a cash till. No cards in those days! No food staff handled money and my mother would write the amount due, say for cold meats etc on the outside of the grease proof paper wrapping. All canned and bottled items were individually tagged with prices. I seem to recall that the lady in charge of staff recruiting was a well proportioned Jewish lady. As far as her name is concerned I am in league with you. I never worked at Payne Bros so I’m afraid that I am unable to help. It was, as you say, one beautiful shop! After writing Matric exams I worked at Milady’s in West Street during the Christmas holidays. This was in 1972. I really enjoyed it – I worked in the Ladies Lingerie Dept! 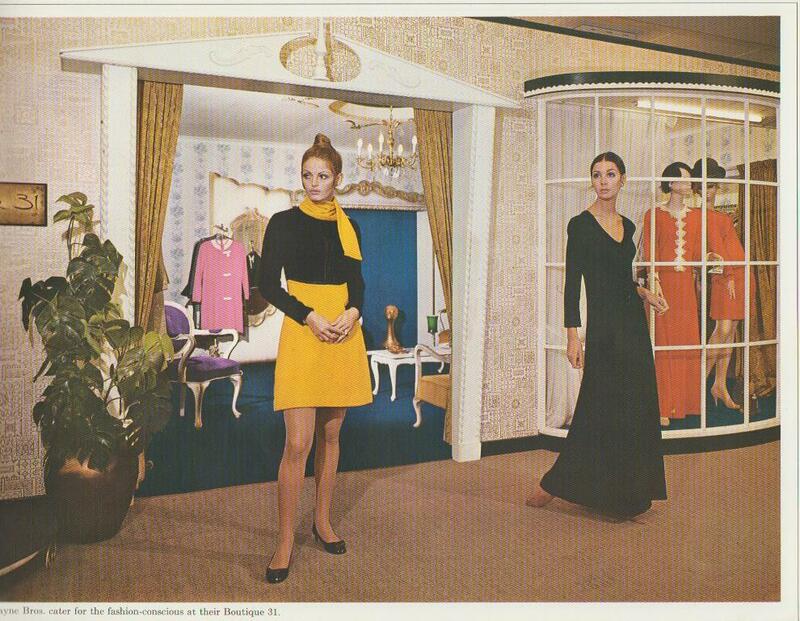 I remember that back in the late 60’s and early 70’s Durban had a couple of boutiques that were very popular. One was at the Smith Street end of Murchies Passage and was called “Up and Down the Stairs” – very groovy!! The other boutique was on the West Street end of Murchies Passage but I’m afraid that I can’t remember the name. Perhaps Gerald will be able to help. My mum SALLY JONES worked at Payne Bro’s’s in the late 50’s early 60’s. She was a buyer in the ladys dept. I do remember the trechikoff exibition. In fact I have a signed print. I remember the window shopping very well. It was a family outing! Especially at Christmas when they had all the lights. “Plums in May’ was at the Hub from what I remember. I stand to be corrected but I seem to remember that Plums in May was a Greenacres sale event. We need a newspaper ad to verify this. Hi I worked in the hair salon in 1976 /77 and it was called Salon Mayfair. I remember a few names but not surnames. It would be so nice to hear from someone that I worked with way back then. Some names I remember are: Kevin (owner) Stephen hattingh, Sally, Charles, Jackie, Lorraine (stock control lady), Alison, sue, Joy (receptionist) erica. The salon then was still one of the best in Durban with Stephen being the Natal hairdressing champion. Hi Simone, As you “hoped to hear from someone” I will respond now. You may have read my article, some of which referred to my apprenticeship at Payne Brothers Ladies Hairdressing Salon from 1962 to about 1966. I was surprised today to see yet another entry posted. Reading all the ones that have been since then, I saw your entry. It is sadly, the only one written from a former hairdresser! In spite of you having worked there in 1976/77, when it was called Salon Mayfair, being a Durban hairdresser, would you have known any girls that worked at Payne’s in the 1960’s when I was there? One I’d sorely like to contact, if not all of them, was a blonde called Sandra Somerville. When I left for Canada in 1977, she had her own salon called CHEZ CHERIE. It was on the first floor, Poynton House, Gardiner Street (opposite the post office). When I visited for the last time, she was doing the hair of a Mrs. Humphreys, a former client, who had worked at Payne’s! Sandy was then living in New Germany, near Westville I believe. I still have Natal Mercury paper clippings of myself, first when I started Hairdressing and then when I entered the ‘Fantasy/Cocktail’ competition held at the Natal Technical College. I’m really sorry that the names of people you worked with, do not ‘ring any bells’ with me. — Tony. I am the second youngest daughter of Theo and Dora Vogels. All my siblings are still alive and I am sure you are aware that both my parents have passed away. Who were your parents? Mimi and I both live in East London ZA, Berdy lives in USA, Stanley lives in Australia and Elisabeth in Bluff Durban. My own early memories of Paynes were stirred by all your stories! Did anyone remember Brian Clarke? He worked for the store for many years from a young age, and had something to do with Operations. Does anyone remember when Sprinbok Radio used to appear in Payne Bros. Window in the morning with Eric Egen doing the show.? I also spent some years in the Gents outfillig department of Paynes. I worked with a Charles Dearden, a Rob Maggs and some others. there was also a guy “Andy” in the suits dept as well. Hi, any photos of the Payne brothers celebration 1969 , streets were closed in the evening and there was a drum majorette march etc. I have the actual brochure printed to commemorate the 100 years of service. I will scan and post some of the pictures included. This is directed to Sandra. If you are the hairdresser that worked at the salon in the early 1960’s, I’ve been looking and wondering what has happened to you for the past 40 years!!! Please say it’s true. From your apprentice Tony, who now lives in Canada. Oh and by the way, I worked on the third floor in the Salon from about 1961-65 and don’t seem to remember a theatre there but, I probably was doing other things. I think that the theatre was called the Pabros Theatre. I remember being taken to see some shows there, a magician show and an art exhibition by Tretchikoff. I even got to shake hands with the great man (who rather reminded me of a MrSteiner who was a master at DPHS), but my mother perhaps unfortunately did not buy a signed print, let alone an original. Thinking of Tretchikoff reminded me of another related story, At the time mentioned above, I was probably still at DPHS. A few years later at Northlands High the artistic merits or otherwise of Tretchikoff were being discussed with Mr Theo Shippey (who has been previously mentioned on FAD). Mr Shippey as I recall had a low opinion of Tretchikoff and I think said that he was merely a competent commercial artist who put no soul into his paintings. Since I have no artistic pretensions I won’t comment on Tretchikoff”s artistic abilities, but inevitably Mr Shippey got shouted down by the class, saying that other artists were merely jealous of Tretchikoff’s success. 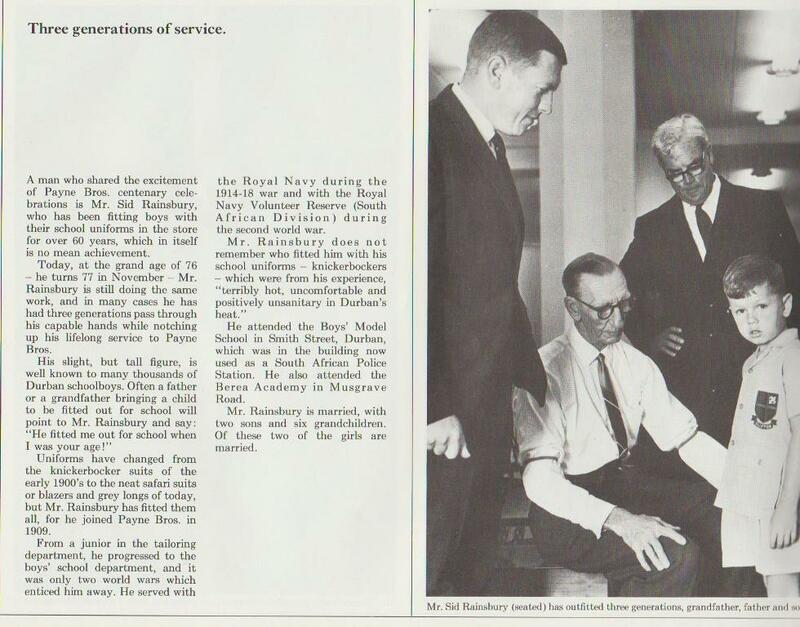 Mr Shippey went on to become Rector of the Cape Technikon. I wonder if he is still alive in retirement? Thanks Gerald that would be great I was the lead drum majorette so would love to see some photos. My email fairwayherm@mweb.co.za. The brochure had very few photos and strictly speaking for a centenary commemoration I would rate it as rather mediocre. There are no pictures of the drum majorettes at all. I will post the pick of a rather meager bunch. Here are the best pictures from the brochure. 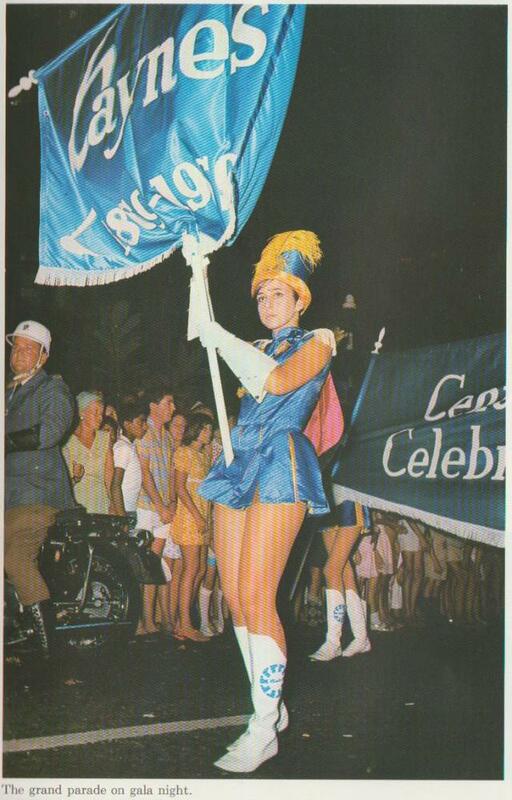 There is one of a drum majorette. Maybe it is you?? Mrs WA Cooke, daughter of George Payne. 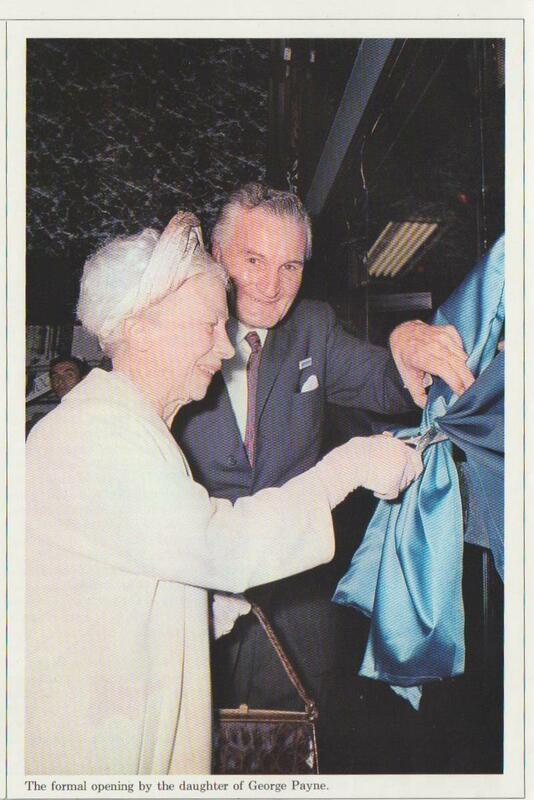 The caption of the smallest picture is “some of Payne Bros. oldest friends and customers at the celebrations. Boutique 31 was upstairs if I recall and fashion shows were held often. Anyone recognise the Durban Models. There was a Durban Modelling School active at the time. By coincidence my neighbour is the son of the now late Mr Rainsbury. He is now 89 years old. Small world. Yes that reminded me of the Pabros Theatre in Paynes. I remember going to have a look at Tretchikoff’s exhibition and if I recall the green Bali woman painting was shown. Must have been 1959/1960? I also recall the art critics having a go at Tretchikoff’s work being too commercial. I wonder who the three generation family would be in the school outfitting department. The little boy must be in his late 50s now. That was the Clifton Primary School uniform.